The Razer DeathStalker gaming keyboard delivers merciless power with its slim keycaps designed for shorter travel distance and rapid-fire actuations. Your fingers will be flying across the low-profile keys at lightning speed and in comfort, executing commands for your master plan faster than enemies can react. Unlike traditional keyboards that can only register up to three simultaneous key presses, the superior anti-ghosting technology built into the Razer DeathStalker allows up to 10 simultaneous key presses to obliterate the competition more effortlessly. Every key actuated at the same time will respond accurately in-game with zero lag. it's a great keyboard and I don't normally have much good to say about razer apart from their items look the part. are expensive membrane keyboards actually worth the price ? Already have one of these and membrane or not I like it, so ordered this one thanks, great price. I had this years ago when it was around £100. If you like flat notebook style keyboards then this is for you. At this price it's great. 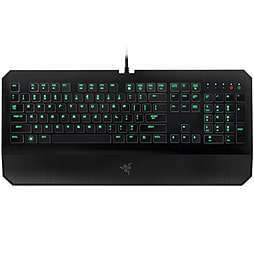 "Razer DeathStalker – Membrane Gaming Keyboard"
Mechanical keyboards are good if that's all you use. I use membrane at work and find sticking with them better. I had this years ago when it was around £100. If you like flat notebook …I had this years ago when it was around £100. If you like flat notebook style keyboards then this is for you. At this price it's great.